For those who don't know Victor Smolski yet, he's Rage new guitarist and played in Mind Odyssey before. This release is more an instrumental guitar demonstration with classical background and storyline in English, German and even Russian (by V. Smolski himself). For this release you have Victor's friends from Rage as guests, for lyrical moments where excellent vocal presence of both Mike Terrana and Peavy Wagner. Classical arrangements were done by Victor's father himself. Spoken words comes from historic documents except for one track. The CD cannot really be refered to as a Metal piece. It's opressent atmosphere is unique and terrorizing at moments. As for Victor's guitars moments, they can be amazing and show how much the guy is talented, but I knew that already :), having seen him on gigs with Rage many times now ! This is a hell of a guitarist and I have no doubts he's one of the best around. This album is more atmospheric than everything else and even guitar is not that present, at least not as much as the classical parts are. So are the spoken moments, always scary-ike. The guitar is very technical sometimes... perhaps too much, somehow I would have prefer more melodic moments, like Ronda do for exemple... or even some of Satriani's work. Some moments can even be boring, the sound of the guitar is going all directions and even though I'm sure it serves the purpose of the story it's not very nice to hear. So basically most of the story is in Russian and German, so good luck to understand it (fortunately it's in english in the booklet, scared ya ?). 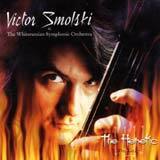 The last song of the album that also bears the name of this release : "The Heretic" is way better than the rest and allows Victor to integrates perfectly into the classical music. Peavy is also singing on this one. Terrana evidently takes care of the drums parts. In the end the orchestral and atmosphere are really nicely done, but doesn't let too much space to Victor to show his talent, or not in the correct way. You hardly notice it sometimes because the classical part is so much in front. In the same spirit I prefer Malmsteen Concerto album. Anyway, you'd better listen to this one first cause it's really more an opera spoken piece than anything else, you might or might not like it. I personally love some moments from "Witch Hammers" and "The Heretic" is really excellent ! As for the rest I'm not sure, like I said try it first :) as it's very different from Rage or Mind Odyssey, but I would give it many points on originality and ambience (might be perfect for background atmosphere in Real Playing Game sessions).